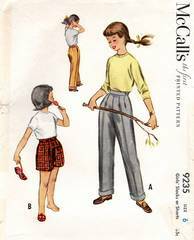 Girls slacks (and shorts) reminiscent of the style worn by Katharine Hepburn. Waistband with side button and zipper closing. Inset hip pockets. Four darts in the front create fullness; two darts in the back. Girls Size 6; Waist 23. Pattern is used and complete. Envelope is complete; clean tape mends on edges.